WorkShops. – Space focused on technology, new media and artistic research. From the democratization of cryptography to the appearance of cryptocurrencies By Martín Nadal & César Escudero Andaluz. Economics, knowledge and surveillance have been put to the service of production and are a new expression of power created by the accumulation of information in the networked world. 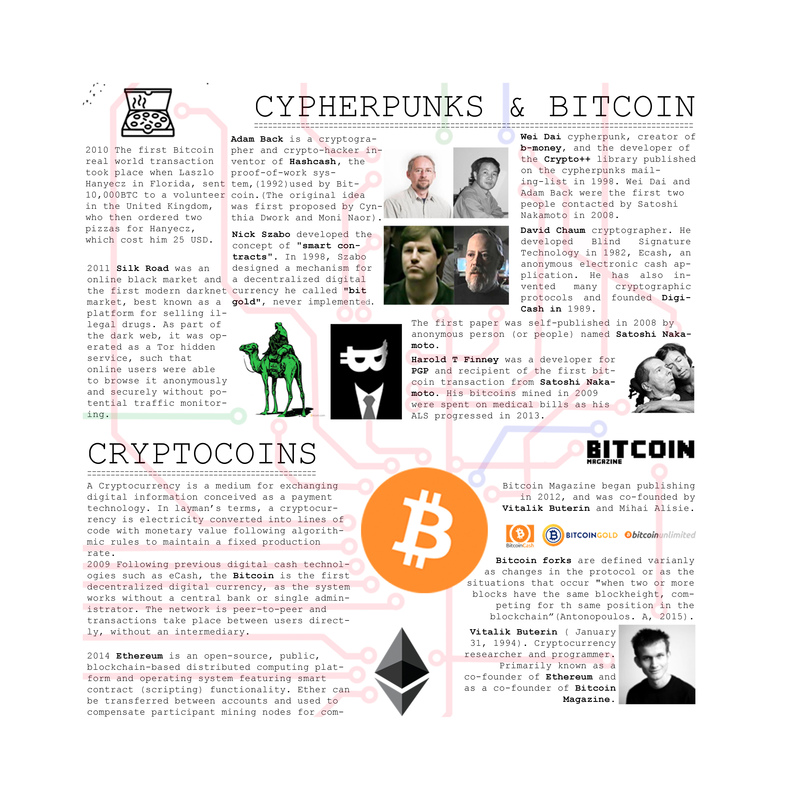 This is a workshop aimed at those dealing with media art, digital culture, critical economics, and research to create a diagram that democratization of cryptography and the appearance of cryptocurrencies are likely to be the most influential events of what we do Called “Cryptocene”, followed. The workshop begins with an explanation of the diagram and the concepts it contains. Participants will be familiarized with a historical crypto-hacker method. In a second step, the participants research themselves and position themselves and their practice in relation to the historical overall development shown in the diagram. In 1988, the crypto-anarchist manifesto written by Timothy C. appeared as a premonitorial text in which cryptography redefined the realm of possibilities and redefined power structures within society, especially between individuals and governments. Three years later, Phil Zimmermann developed Pretty Good Privacy (PGP), which signs, encrypts and decrypts texts, e-mails, files, directories and entire disk partitions, which increases the security of e-mail communication. Eric Hughes in A Cypherpunk’s Manifesto (1993) makes an analogy between privacy and secrecy to defend the rights of open society, and points out that privacy is the power to be selective in the world. Internet Dissidence Theory and Practice Workshop, It proposes the creation and modeling 3D of tools in order to alter or cut underwater Internet cables, making them available to all netizens in a free download .stl files, for later 3D printing. The objective is to return to the users the ability to decide on their data and privacy, as well as to visualize one of the problems that the technology hides behind the user’s gaze. Keywords: Speculative design, Critical Engineering, speculative design, deep cables. Bitcoin of Things (BoT) Theory and practice Workshop. By Martín Nadal & César Escudero Andaluz. This is a Workshop addressed to those who have concerns with Media Art, Digital culture, Critical Economy, Electronics and Internet of Things (IoT). Theoretically, it introduces concepts, examples, art-works and books in order to understand Bitcoin and Blockchain world. Practically proposes to work with a basic electronic circuit, welding and microcontrollers building a playful bitcoin miner. The objective is to transform daily life objects (E.g. Maracas, hammers or salt shakers) into Bitcoin miners able to connect to the blockchain, calculating a hash to trying to get a reward of 12.5 Bitcoins. Keywords: Device Art, Critical Engineering, speculative design, Wireless interface. Nastty Tricks Bots (NTB) WorKShoP. Mechatronics + IoT. Theory and practice. By Martín Nadal & César Escudero Andaluz. Connecting physical and virtual worlds, this is a Workshop addressed to those who have concerns with Human-Computer Interaction, Critical culture, robotic and Kinetic art, mechatronics and Internet of Things (IoT). Theoretically, this workshop will introduce a tour on the history of robotic art by the use of concepts, examples, books, philosophers, trends and collectives dealing with ideas as “Human body obsolescence” from Stelarc, or the “Urban parasites” by Gilberto Esparza, emphasising on key concepts and topics such as vulnerability, surveillance, bio-robotics, data and Net-bots, absence and presence, public and private, etc. Keywords: Device Art, Critical Engineering, speculative design, mechatronics, Wireless interface. Physical NETbots, WKSP. Interfight-Do-it-yourself-kit. Theory and practice wksp. This is a Wksp addressed to those who have concerns in Critical Interfaces, new media and non-conformism towards the Internet data management, especially tracking Web site location and Web site analysis, design homogenization and GUI standards. The Practical objectives introduce to basic circuit development, welding and electronics to create a physical Netbot. Keywords: Touch-screens, Tangible User Interface, Human Computer Interaction, Computer-computer Interaction, Artificial Life, Device Art, Critical Engineering. Appropriationism as a cultural production tactic.Theory and practice wksp. César Escudero Andaluz, Alex de las Heras. This is a wksp adressed to those who have concerns in activism and new media, cultural politics and non-conformism towards the institution and the art market. The wksp sets out a didactic tour through the techniques and appropriation activities employed in the last decade based on a political, artistic and institutional act. Keywords. Tactics, Appropriation, Museum, Art, Mass Media, Hacking, Intrusion, culture, Anonimous intervention, Pseudonim. 2019* MoneyLAB#6. Institute of Network Cultures. Bitcoin of Things (BoT), (Germany). 2019* Aksioma+ALUO+Interface Cultures. Bitcoin of Things (BoT), (Slovenia). 2019* Aksioma+ALUO+Interface Cultures. Data Polluters, (Slovenia). 2018. * ADAF 14th Athens Digital Art Festival, Data-Polluters, Athens (Greece). 2018. * ADAF 14th Athens Digital Art Festival, Bitcoin of Things (BoT), (Greece). 2018. * AMRO Art, hacktivism & open culture, Bitcoin of Things (BoT), Linz, (Austria). 2017. * NATIONAL UNIVERSITY OF COLOMBIA. Internet Dissidence, Bogotá (Colombia). 2017. * AARHUS UNIVERSITY. Data polluters, Interfight Kit NETBOTS, on Digital Aesthetics Master. (Denmark). 2017. * NODE Forum for Digital Arts, DESIGNING HOPE, Frankfurt (Germany). 2017. * ARTS SANTA MONICA. Diffractive Interfaces, Data-Polluters. Barcelona, (Spain). 2016. * ART MEETS RADICAL OPENNESS. Festival dedicated to art, hacktivism & open culture, Physical NET-bots, Linz, (Austria). 2016. * ARS ELECTRONICA FESTIVAL. Radical Atoms, Mini-maker Faire, Physical NET-bots, Linz, (Austria).